(Nanowerk News) Researchers in London have found that nanometer size diamonds can be attached to a wide range of substrates and that they can promote the growth of neurons without the need for the complex layers of proteins normally required "The use of nanodiamond monolayer coatings to promote the formation of functional neuronal networks "). Confocal analysis of growth of hippocampal neurons after 7-days in-vitro. 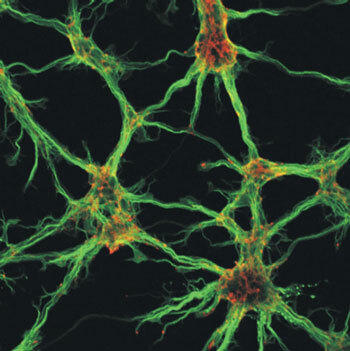 Immunostaining reveals neurons via a dendrite-specific marker (shown in green), while the cytoskeletal filaments of f-actin are stained red highlighting structures rich in f-actin, such as growth cones at tips of neuritis. Neural material can be encouraged to attach itself to solid materials and grow into functioning living networks, but this normally requires the provision of synthetic proteins, which is not desirable for in-vivo applications. Diamond has long been considered to be a biocompatible material, but large area diamond surfaces are not attractive to neurons when it comes to cell attachment. However, the reactive nature and shape of nanodiamonds leads neurons to view them differently, and fully functioning neural networks have been grown without the need for protein coating, which offer great potential for chronic medical implants technologies. The nanodiamonds, produced commercially using a detonation process, can be attached to 3D shapes using a sonication process, which is harmless to most materials. In this collaboration between the London Centre for Nanotechnology (LCN) and UCL’s Laboratory for Molecular Pharmacology (LMP), mouse hippocampal neurons were placed in cell culture solutions containing nanodiamond coated substrates for up to 12 days. Electrophysiological measurements showed that fully developed neural networks resulted, with clear evidence for synaptic connectivity. The LCN’s Professor Richard Jackman states ‘not only is this of great interest in terms of medical implant applications, but diamond can also act as a semiconductor, and we have begun to integrate the living neural networks with diamond transistors on the same chip. In this way we can both stimulate and record neural signals, opening up the prospect for bioelectronic devices’. Jackman, and Professor Ralph Schoepfer of the LMP are currently investigating size and surface chemical effects related to the nanodiamonds, which may control the cells propensity for attachment and growth, remaining firmly fixed to the substrate, as opposed to ingestion of the nanoparticles by the cells.